Alcohol, initially you may feel the euphoria. Hours later the euphoria gets replaced with depression and confusion. 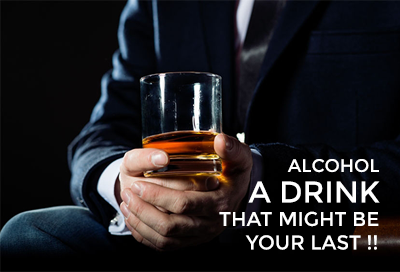 Alcohol gets quickly absorbed into the bloodstream and is rapidly carried throughout the body. It affects Brain and Nervous System of the body. Reaction time is affected, it slows down the Brain and Body functions. Alcohol effects may vary from a person to person and generally depend upon the quantity being consumed. Regular and excessive drinking may lead to severe and long term effects on the health of a person like High Blood Pressure, Anemia, Cancer, Dementia, Depression, Cardiovascular Diseases and Automobile accident. Heavy and regular drinking of alcohol may raise the Blood Pressure to unhealthy levels. Daily consumption of four or more drinks may harm the Liver, Heart, Brain and even lead to death. Reducing the amount of alcohol consumption may reduce the levels of Blood Pressure in a person. However, the fall in Blood Pressure may vary upon age, current level of Blood Pressure and previous drinking history. If a Heavy drinker reduces alcohol consumption to moderate quantities, his Blood Pressure may reduce between 2 to 4 mm Hg. If you already have High Blood Pressure avoiding alcohol is best for you. If avoiding is not possible then drinking alcohol in moderate levels is the best you can do. Generally, one or two drinks in a day is considered normal, anything more than this may harm your body. Below given are the normal levels of alcohol consumption. Normal values of alcohol does not mean one can consume alcohol freely. Avoiding alcohol is the best you can do for your health. I live in United States, help me thank DR. covenant who helped cured me from HERPES SIMPLEX in just one (1) week. I got to know him from a friend who he helped, at first I doubt if his herbal product would work until my friend put her car at stake that if it doesn't work she would give me her car. After which I decided to try, to God be the glory am now a living testimony, all thanks to DR. covenant, if not for him I would not have been healed so easily.. You can reach him via covenantsolutiontemple@gmail.com or call/whatsapp at +2349057353987, you can also contact him on cure on...... 1. GONORRHEA 2. SYPHILIS 3. ASTHMA 4. STROKE 5. DIABETES MELLIFLUOUS 6. SIMPLEX HERPES 7. RINGING EAR 8.LOW SPERM COUNT 9.SICKLE CELL 10.HIV/AIDS 11.CANCER 12.LYME DISEASE .,,,..
Best article has been given here. Thank you , very informative. Very nice information has been given. Thank you herbpathy for this great help to commoners. How to manage the blood pressue. will any body help me on this. Vikas/Mohit.. Alcohol or beer were never or will be good for health. Did our grand grand grandest fathers ever drank alcohol, still they were health. alcohol, beer, wine, etc may give you initial euphoria .... but ultimately they will only compromise your health. Dear Sir, Is Alcohol help the patient who suffering from mentally tress. please suggest.